Assassin’s Creed Odyssey continues to expand after the game’s release, offering new challenges and rewards for hearty mercenaries. The latest, a battle against a towering cyclops, could have been a tough and rewarding fight. Instead, it’s surprisingly mundane. 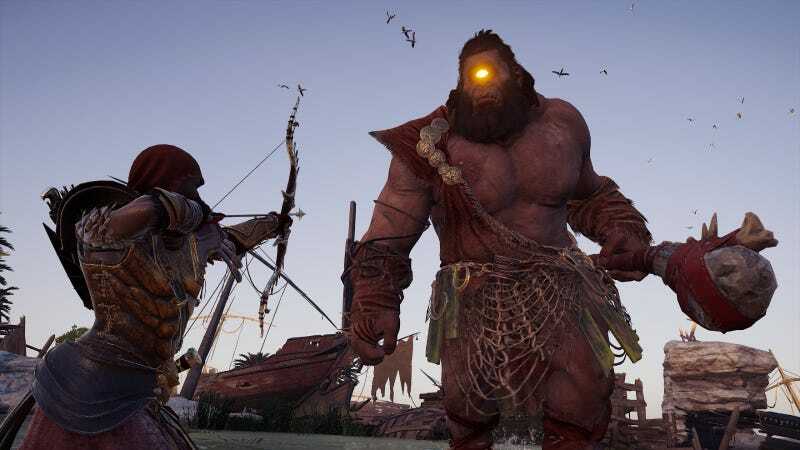 Odyssey’s live events hit a snag last month when Ubisoft failed to implement the promised legendary mercenaries into the game, who are heartier foes that drop quality loot as well as the game’s premium currency orichalcum. They still haven’t arrived, but other events have shown up instead, like challenging ship battles and newly-added questlines. The latest addition opts for something more dramatic, adding a towering cyclops called Steropes to the world. Odyssey’s more fantastical elements were some of my favorite parts of the main game, even if they sometimes felt optional. The prospect of a new monster was exciting. Unfortunately, the fight against Steropes is something of a letdown considering how challenging the mythological encounters were in the main game. The arena—an open cove dotted with shipwrecks—is very large and offers ample space to dodge the cyclops’ swipes and shockwave-emitting smashes. You’ll take tons of damage if you are hit, but with so much space, that’s not much of a concern. I have mixed thoughts about adding more mythological creatures to Assassin’s Creed Odyssey, and the Steropes fight did little to assuage my worries. One the one hand, Ubisoft’s continued support of Odyssey ensures a world that is reactive and continually full of adventure. On the other, there’s something strange about simply plopping a cyclops in a cave without the greater context and care that went into the main game encounters. Those fights took place in moody ruins and dilapidated First Civilization complexes. You got to walk through a canyon of stoney corpses in the leadup to the Medusa fight. The Sphinx’s sudden appearance, crashing forth in a burst of energy, was dramatic. Steropes is simply a monster in a cave, no different than one of the game’s many bears. I appreciate the effort to keep the world alive (and acknowledge that live events are meant to be more easily implemented) but this felt more routine than I’d like. Odyssey’s live events and new quests have mostly worked. Epic ship battles are far more challenging and the first of the “Lost Tales of Greece” was a silly affair that let players participate in one of Thespis’ plays. But the first mythical event feels plain by comparison. It’s too easy to be exciting fight and lacks the wonder found in the main game. It’s little more than a chance to get nice loot, when it might have been a truly epic showdown.